After a brief hospitalization following a suicide attempt the previous fall, Delaney spent two horrific months on her own in the throes of withdrawal. The corners of her eyes felt “chapped,” and “it felt like somebody had wrapped me up in a scratchy blanket of needles,” said Delaney, who had given up her nursing license after being caught altering her Klonopin prescription. Sara Kaiser, an LPN living in Manchester, stole morphine from the nursing homes where she worked and was addicted to heroin from age 18 to 24. She spent time homeless and in prison, ultimately going through 14 rehab programs before getting sober in 2010. Heather Delaney, 40, looking out in her backyard. Both were disciplined by the state Board of Examiners for Nursing, but after years of hard work, they are among 18 nurses who have gotten their licenses back in the past three years. Delaney, 40, now sober and living in Oxford, is a certified nursing assistant who is looking for a nursing job. Kaiser, 32, works in addiction recovery. “I use my nursing skills, but I … have a job where I don’t pass meds,’’ Kaiser said. A C-HIT analysis of the board’s cases between 2015 and 2017 shows that drug use is common among the disciplined nurses in Connecticut. Of its 282 cases, 82 percent involved substance abuse: 23 percent related to alcohol, and 77 percent were drug-related. More than 64 percent of those drug-related cases—113—involved opioids, including oxycodone, morphine, heroin and Fentanyl. Among those disciplined, about four dozen nurses stole drugs, many falsifying records to cover their thefts. One nurse stole 14 Fentanyl patches, including from her nursing home patients. One heroin-addicted nurse robbed banks. Another stole patients’ jewelry and laptops. But the percentage of drug and alcohol cases is likely higher than 82 percent because 51 nurses voluntarily surrendered their licenses. Most do so after being accused of substance abuse, said Christian D. Andresen, section chief of Practitioner Licensing and Investigations for the state Department of Public Health (DPH). He said the 82 percent of nurses represent a tiny fraction of the 82,480 nurses licensed in Connecticut. Another 223 nurses have avoided public discipline and a subsequent report to a national database by entering a confidential program, the Health Assistance InterVention Education Network, or HAVEN. Cases spiked after a 2015 law made it mandatory for employers to report impaired nurses, Andresen said. In a 2013 report, the National Council of State Boards of Nursing, citing staff shortages, long work hours and changing shifts, said nurses are at a higher risk than the public for developing a substance abuse disorder. Patricia C. Bouffard, Connecticut nursing board chair and a registered nurse, said that during her 15 years on the board, the number of substance abuse cases has always hovered at 80 percent, although more now involve opioids. Nurses are prone to on-the-job injuries, noted Geraldine Marrocco, a Yale School of Nursing associate professor who also serves on the nurses’ board but did not speak for the group. When Edie Falco’s character was sprinkling Percocet in her coffee in 2009 on “Nurse Jackie,” nursing groups condemned the TV show. But addiction is a serious national concern to regulators, who worry that nurses are harming patients and themselves. The American Nurses Association says 300,000 nurses, or one in 10—the same rate as the general population—are addicted to drugs or alcohol. “This is at the top of our radar,’’ said Maryann Alexander, the chief officer of nursing regulation for the national nursing boards’ council. Delaney was first treated for depression and anxiety in her early 20s, but the stress of nursing made her symptoms worse, she said. She also became paranoid, believing that people were following her in white vans. At age 25 in 2002, she was working for an insurance company during the day and nursing at night at Garner Correctional Institution in Newtown when a psychiatrist diagnosed her as bipolar and prescribed Klonopin. “I enjoyed the feeling of it because I didn’t feel paranoid,” she said. By 2010, she was taking five to six pills a day—more than prescribed—and was caught changing the dosage and number of pills on her prescription. 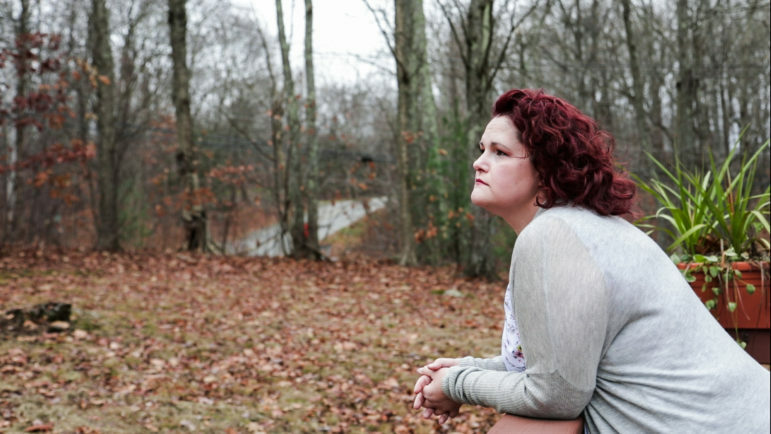 “I was just scared that I wasn’t going to have the drug that made me feel OK,” she said. Her treatment at Bridgeport Hospital was followed by six years of therapy while working as a housekeeper. She got her license back in 2016 and is ready to go back to being a nurse. When she gets a nursing job, she’ll start a four-year probation with the state. Kaiser had her nursing license placed on probation in 2009 after she stole a sedative at a nursing home. The license was revoked in 2010 because she abused heroin and morphine. Sara Kaiser, 32, sitting on her couch in Manchester. A Cromwell native, she studied nursing at Saint Anselm College in New Hampshire but lasted only one school year because of anxiety and alcohol, marijuana and cocaine use. “Once I found it, it was like, ‘I can breathe’,” Kaiser said. During periods of sobriety, she earned her LPN degree and worked in nursing homes, but admits she was shirking and stealing drugs. She said she quit nursing to avoid harming patients. She spent several bleak years on the streets of Hartford and in an abusive relationship with an older man, she said. After a 2008 arrest for evading responsibility and drug possession, Kaiser said she spent a few weeks in prison. The charges were later dropped. At first, she said, she tried getting sober to regain her nursing license. She said that by finally focusing on herself, she was able to get sober. She has since earned an associate’s degree and a bachelor’s degree and is working on a master’s online from Purdue University. She got her license back in 2016 and is the corporate care training manager at Aware Recovery Care. She is on a four-year probation with the state. Marrocco and E. Carol Polifroni, dean of the University of Connecticut’s School of Nursing, said their students are well educated about the risks of addiction. Since 2015, the nursing board has revoked licenses in only 17 percent of its cases. That’s because the members tend to give nurses a second chance, Bouffard said. DPH’s Andresen said he has no evidence that more Connecticut nurses are getting addicted than in past years, and Rodrick Marriott, director of the Drug Control Division of the state Department of Consumer Protection, said that he has seen no increase in nurses’ “diverting,” or stealing, drugs. “This is a disease, and sometimes you relapse,” she said. Andresen said no one can enter HAVEN if they have harmed a patient, are facing other discipline, have been disciplined in the past or have been charged with or convicted of a felony in Connecticut or a similar crime in another state. Nurse referrals to the program have increased from 57 in 2015 to 75 in 2017, and 230 nurses are now enrolled, HAVEN’s executive director, Maureen Sullivan Dinnan, said. Nurses with an addiction are monitored for several years with random drug testing. Dinnan said many nurses have gone through trauma and some turn to drugs because of “pharmacological optimism,” the faith that medication makes people better. “They see people in terrible emotional and physical pain who improve on medication, so when they are in terrible emotional and physical pain, they self-medicate,’’ she said. Delaney, who said her mental health has stabilized and she has a better balance in her life, said nurses in recovery deserve another chance. “When you go back into nursing, you go back as a better person, more whole than you were before,” she said. You can listen to WNPR’s interview with C-HIT Writer Kate Farrish here. About The Data: C-HIT reviewed nurse disciplinary cases using three years of public records from the Board of Examiners for Nursing and the state Department of Public Health. The records from 2015 to 2017 were reviewed to determine if the cases involved alcohol, drugs or opioids. Cases in which nurses made repeat appearances before the board under the same case number were combined. Nurses who voluntarily surrendered their licenses were included because voluntary surrenders are reported to the National Practitioner Data Bank. Nurses who are disciplined by the state are also reported to the database, but those who complete the confidential HAVEN program are not, and their cases are not heard publicly.